Whether you’re brand new to blogging or want to learn more about what is blogging, this is your guide to create and scale a successful blog. Do you want to know what is a blog or what is blogging? If you’re wondering how blogging can help you? In this detailed, yet easy-to-understand blogging guide, I’ll explain you the basics of blogging and a beginner-friendly guide to start a blog (step-by-step). From being broke and jobless in 2012 to making a living out of blogging, I’ve had this life-changing encounter with blogging. Blogging gave me the confidence to face people, share my ideas boldly and direction in life that I had been missing when I was jobless. Having said that, building a successful blogging profession wasn’t that easy. I spent a good number of years figuring out the ins and outs of blogging. With this resource, I aim to save you the years of confusion and trial and errors by giving you the ultimate guide to building a successful blog (to make money or otherwise). Blogging is the act of content creation to inform, educate and or spread your ideas about any topic on the internet. In other words, blogging is the art and science of sharing your ideas with your audience. While Wikipedia and other outdated definitions of blogging show blogging as a personal and often discrete channel to share your personal stories it has completely transformed over the years. Blogging now has become a powerful channel that helps you build your own community of raving fans, subscribers and earn a living (right from your couch or kitchen) out of helping people solve their problems with your solutions. Now, you don’t have to take my word for it. According to Ahrefs (one of the best keyword research tools out there! ), 73,000+ people are searching for the term “blogging” on Google every single month. That is 2400 searches every single day for the term “blogging”. Leave alone the permutations and combinations of this with related searches like “what is a blog” or “how to start a blog” or “how to blog” etc. For example, if we consider the query “how to start a blog” it alone has 45000+ monthly searches, so you can assume the sheer number of people looking to know more about blogging and how it can help them. According to Statista, the number of bloggers in the United States is set to reach 31.7 million users in 2020. There are millions of blogs on the internet and over a billion blog posts are produced every single day. But not all blogs are created equal. Some blogs lack focus and clarity while others are a massive success. Some are hobby blogs limited to only family and friends while other blogs have a positive influence on the internet (not to mention the jaw-dropping income that they generate). Please Note: The examples below are meant to show you some of the case studies of blogging success and what you can achieve through blogging. Please know, blogging is not for everyone and scroll to this section to test if blogging is for you. One of the most glorifying examples of blogging success is the Wirecutter Success Story (you might have come through this while searching for gadgets reviews and recommendations). their style of blogging is simple. They write reviews of gadgets (including lists of top 5 or so in a product category and then recommending the best one) based on extensive usage, curated reviews of users and other experts and an often unbiased recommendation of the products. They then make money from affiliate commissions when readers click on product links on their blog and buy them. Look at their traffic numbers (estimated, not exact, which is often 2x or 3x than what Ahrefs shows below). Don’t miss the traffic value (estimated earnings from that traffic) suggestions at the end. Result: New York Times bought the Wirecutter for a whopping $30 million in 2016. There are plenty of blogs in a plethora of niches or topics (we discuss this in detail later in the article) that do quite well and are perfect examples of you don’t have to be an expert to start a profitable blogging business. Michelle Schroeder-Gardner paid her student debt of $40,000 in 2011 from her blog MakingSenseOfCents while it was only a side hustle during the night. Her blog has grown since then, and she crossed her first $1 million in revenue while she was only 27. Michelle doesn’t have any formal degree or certificate of expertise for the finance and frugal living tips she shares on her blog, what she has though, is tons of real-life experiences and lessons from them and the willingness to change her readers’ lives with that information. Here is an excerpt from her last income report (she stopped sharing them publicly in 2018) where she reports to have crossed $1.5 million in revenue. Do we need to be an expert to start a blog? No. You don’t need to be an expert to start a blog, but you need to have a clear understanding about the topic you’re going to blog about and the willingness to learn more about it as you continue blogging. 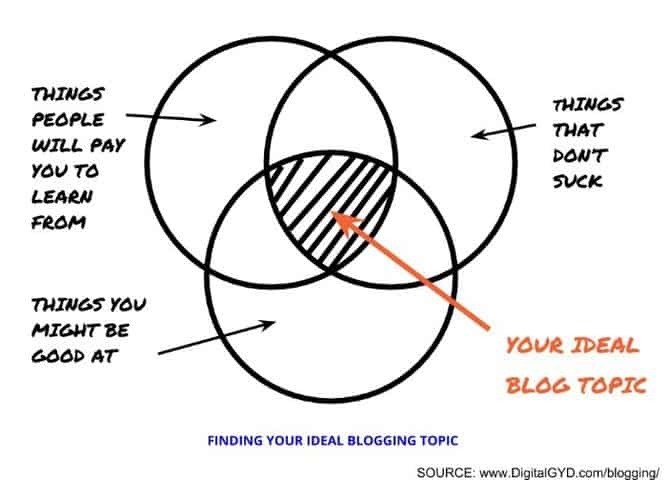 One doesn’t have to be an expert to start a blog (we’ll discuss how to find your blogging sweet spot later in this article – click to jump to that section). or anything that your friends and near ones come to you asking for help like health tips, social media tips, fashion ideas etc. willing to help your reader community & learn on the way. …let’s discuss what is a blog and how is it different from a website, shall we? A blog or weblog is a part of a website where you publish content (including text, images, and videos to make the articles informational and engaging) in reverse chronological order or newer posts appearing first. Blogs are typically managed by single users but there are tons of examples of massive corporate blogs run and managed by teams of 100 or more people. What Is the Difference Between a Blog & Website? While blogs are essentially a type of website, blogs and websites are not the same. Content Frequency: Blogs are regularly updated with new content (even multiple articles a day) while a website is a more static web entity optimized for static content with no new or fresh content. Readership & Engagement: A fresh content uploaded, blogs often create a connection with your readers (& subscription options via newsletters) and attract engagement like social shares & comments from the readers. Websites, on the other hand, to do not encourage conversation and hence no scope of audience engagement. Blogs get more traffic: Another advantage of blogs over websites is that blogs get more visibility on social & search engines. Hence they drive more traffic to you as compared to websites. With all the above points on blogs vs websites don’t assume that websites are a bad idea or obsolete. Each has their perks and usability depending on what you want to achieve. This very blogging guide that you’re reading right now is on my blog DigitalGYD.com. It is a perfect example of a blog with regularly updated content, search engine ranking, user engagement etc. Whereas, my professional website www.swadhinagrawal.com (that I used to use as my freelance writer portfolio) is a perfect example of a website. It has static content that is not updated regularly, has a few number of pages (about 6 or 7) and doesn’t have any engagement or comments except for a call to action button to hire me. Benefits of Blogging: How Can Blogging Help You? Why Is Everyone Talking About Blogging These Days? What is the significance of blogging? How can blogging help me? Everyone these days has a blog (or two) of their own. … or be it people like me who use blogging to earn a living and connect to like-minded people online. Heck! Even businesses use blogging to rank on Google and generate leads. Recommended Reading: 21+ Blogging Benefits You Must Leverage Right Now! By now, I hope you have a fairly decent idea about blogging. Let’s see how you can create a blog for yourself make it successful. Starting a blog is easy, and you don’t need to have any coding skills or website development skills to build a website. Here is how you can get started with blogging the right way! Please Note: I have written a step by step guide on how to start a blog, the RIGHT way or read below to get an idea about the blog creation process. What is a niche in blogging? A niche in blogging is defined as the topic of your blog or the subject that you’ll blog about. You can blog about a single niche or have a multi-niche blog. But, can we not have a blog about everything or any topic we like? You can. After all, it’s your blog. … multi-niche blogs rarely strike the right chord with their readers. A single niche makes it easier to find an audience of raving fans that can relate to you. Moreover, Google also is giving preference to blogs with topical authority (which means blogs that have expertise in a topic) rather than a blog that covers every single keyword under the sun. But what if I am not an expert or can’t decide on a niche? Choose a niche you have some clarity on: I am not talking about expertise (it can be acquired while you’re growing your blog) but you need to have some clarity about a topic before you start pumping put blog posts about it. Even if you outsource the blog content, you’ll need some knowledge to supervise your writers and see how your blog is performing. Choose a profitable niche: Let’s be honest here. We build blogs to make money or generate leads for profit. Unless you’re just testing out or want to open a hobby blog you need to make sure your blog niche has enough demand amongst the audience. You can do so using a tool like Google Trends (and see how people are searching for a topic and the search trends over time. I’m not going to throw you to the wolves with just a summary. Make sure to check out this detailed guide on how to find your niche. Your blogging platform or the blog site that powers your blog is another important aspect of things to consider before starting a blog. I use and recommend WordPress. WordPress is the most used CMS (content management system or blogging platform) with a market share 33.4% and powers more than 1/3rd of the top 10 million sites on the web and is free to use, provides the best features and flexibility you need to run your blog. Don’t fall for the free blogging platform temptations, they do more harm to you than good. They’re bad for SEO, don’t rank well, lack features and the biggest of them all, you don’t own your content. Your blog can get deleted or compromised and you can’t demand an answer. After you finalize the niche, it’s time to register a brandable domain name for your blog. While choosing the domain name, you need to keep certain things in mind. The domain name should be short enough (the less the number of characters the better). A brandable name that is easy to remember & pronounce. A good example of brandable domain name is Backlinko, Moz, DigitalGYD, Ahrefs, etc. It should be a .com domain if you are creating a worldwide brand. Do not use numbers, hyphens, and phrases that don’t make sense. Value Bomb: Use these excellant blog name generator tools to find cool domain name ideas. Now, of course, you need to keep all the above things in mind but don’t waste a lot of time in picking up the domain name. Because in the end, the content that you publish will build your brand and not just the domain name. Pro Tip: Don’t just register your domain name just yet! Just finalize the domain because most hosting providers (you’ll need them to host your blog) provide you free domain names. You’ve selected your domain name, now what? It’s time to get a good web hosting to host your blog. Instead of recommending you a list of web hosts and create confusion we recommend you to start with Bluehost. Bluehost is recommended by WordPress and is one of the top 5 web hosting companies on the web. Bluehost is officially recommended by WordPress and is best-in-class for starters. Afterwards, when your blog grows and when you earn enough to invest back on your blog you can use premium hosting services like WPX hosting or Kinsta hosting for that matter. Check out our list of monthly web hosting providers if you can’t manage to pay annually for hosting. The final step to set up your blog is to install WordPress on your website and start creating awesome content for your blog. Congratulations! You’ve successfully completed the blog creation process! Now that you’ve created a blog for you let’s now give you the unfair advantage of resources to take your blog to the next level crushing every competition that tries to outrank you! You know what the problem with first-time bloggers is? They don’t know what they don’t know, and that is the worst thing about starting a new project. That’s why I’ve put together this resources that I wish I had when I started blogging. That’s true! One of the most vital component of the blogging success formula creating stellar content. You may write the nicest of stories, you may have the best blog design out there, but if your writing lacks clarity, you’ll not get the attention it deserves. Having said that, improving your writing skills is like sharpening your scissors. The more you sharpen then better it cuts. The better the content you create, the better your blog performs. Here are some of our best guides to help you write better blog content that pleases not only search engines, but also your blog readers. One of the worst blogging advice that ruled when I got started with blogging was, “build it, and they’ll come”. With more than 2 million blog posts published every single day, the publish and pray method simply doesn’t work. SEO or search engine optimization helps you rank your blog on Google for the queries your target audience is searching on it. Organic traffic (or traffic from search engines) is by far the largest source of referral traffic for blogs and have the highest potential to convert (to sales or affiliate clicks etc.). Here are some of our best guides on optimizing your new (or established) blog for search engines and leverage passive traffic throughout. You can never have enough traffic! Apart from SEO (which is the best way to get website visitors), you can leverage social media platforms (like Facebook, Twitter, Pinterest etc. ), email subscribers and networking to get your blog in front of a new set of audience. After all, the age old saying “don’t put all your eggs in one basket” still stands true! Blog Monetization: Learn How You Can Make Money as a Blogger? Unless you’re from a royal family and are feeling generous, you need money to run your blog. At least the aim of this blogging for beginners guide is to show you how to make money from your blog, make it profitable and build an online business. I’ve written a detailed guide on how to make money with a blog, but I’ll discuss important methods here to give you an idea about blog monetization techniques. Fun Fact: Check #5 below to see our preferred method of blog monetization (the one we use here at DigitalGYD). Selling services is probably the best way to make money from your blog without any investment. You don’t need a lot of traffic to sell your services, just the right amount of traffic will do. Virtual assistance services like managing inboxes, bookkeeping etc. Translation & proofreading services etc. One of the easiest way to earn money from your blog is through showing ads on the website. However, you need high traffic coming to your site to make a considerable income from your blog. The biggest ad publisher network in the market is Google AdSense. If you are receiving some traffic on your blog, you can apply for Google AdSense and start earning some money right off the bat. You can also try alternatives like Infolinks and media.net to earn from low traffic blogs. Selling your own products like eBooks, training videos, courses, or stock photos etc. to make a decent income and keep everything off it (unlike affiliate marketing where you get to keep a cut of the total price). Understand what pain points your audience is facing, what is keeping them awake at night, how you can help them solve this problem and create a digital product around it. Consultation, coaching, speaking gigs are also a part of the services you can start to get paid via blogging. …you need to be really good (an “expert”) in your field to leverage these services for blog management. Experts in their niche charge over $600/hr for one-hour consultation call. And speaking gigs can bring you name, fame and stardom (in your niche) along with money. Affiliate Marketing is a $6.8 billion industry. You can make a lot of money through affiliate marketing. If you have no idea what am I talking about, basically, affiliate marketing is when you refer a product or service to your audience, and if they buy it from your link, you get a commission for the sale generated. For example, affiliate marketing makes the bulk of our blogging income here at DigitalGYD. We recommend products that we think will benefit our users and help them solve their issues. We also review services and products related to our niche through extensive tests and then come up with product reviews. People search for the reviews of a specific product and click on our link from Google SERPs. At DigitalGYD, we aim at writing extensive and unbiased reviews (all of my reviews come with a “cons of the product” section amongst others). And if you want to monetize your blog with affiliate marketing, you must go by this rule too. Unbiased and thorough reviews generate trust and credibility in your readers’ mind and convert better. Not to mention, you’ll always be rewarded for the karma of doing honest business. Things go wrong & mistakes happen, especially when you are new to blogging. But, smart bloggers don’t give errors a chance to stand in their way. Here are the most deadly mistakes that might sabotage your blogging career. Because most of these are the ones you don’t even realize you are making. That’s everything you need to know about blogging. Apart from the perks like financial freedom, popularity and an audience that craves to hear from you, blogging is a great way to express yourself and spread your ideas to almost everyone in the world, right from your couch. I hope our Blogging 101 guide helped you get clarity about what is blogging and how it works. If you have any queries related to blogging or need help to get started with blogging, feel free drop a comment down below and we (me and you) will figure out how to fix it. P.S. If you liked our definitive guide to blogging, please do us a favor and share it on your favorite social media platform. Every single share (be it a Facebook share or a tweet) means a lot to help this resource reach other budding bloggers. May 27, 2003: Matt Mullenweg and Mike Little officially launch WordPress. October, 2003: Software company Six Apart launches Typepad (another blogging platform). That was the complete timeline of important blogging events. I hope you got an idea of how blogging has evolved over the years.